Order Just Wholefoods Veggie Jelly - Strawberry from the Online Health Food Store UK. 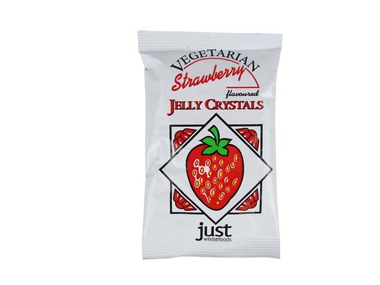 Buy Just Wholefoods Vegetarian Jelly Crystals - Strawberry flavour and other quality Vegetarian Jelly safely online in the UK. This vegetarian jelly is easy to make by just pouring boiling water over the crystals and leave to set. Raw Cane Sugar, Gelling Agents (Carageenan, Locust Bean Gum), Natural Strawberry Flavour, Citric Acid, Natural Colour (Beetroot Red), Acidity Regulator (Potassium Citrate). Our UK Health Shop sells real Just Wholefoods and other Vegetarian Jelly from top-quality brands safely online to customers throughout the United Kingdom in England, Wales, Scotland and Northern-Ireland. View more products on the Online Health Food Store from Just Wholefoods. Where to buy Just Wholefoods Veggie Jelly - Strawberry safely online? Shop at the Online Health Food Store if you are wondering where you can buy Just Wholefoods Vegetarian Jelly Crystals - Strawberry flavour safely online in the United Kingdom. Our Health Shop is located in the UK and our award-winning independent has been serving customers in England, Wales, Scotland and Northern-Ireland since 1976. You can buy our Vegetarian Jelly online and we post out orders to any UK address. Veggie Jelly - Strawberry - Just Wholefoods Vegetarian Jelly Crystals - Strawberry flavour in Vegetarian Jelly and Miscelanious Ingredients.